For their rotating exhibit, the 49ers Museum tasked John Murray Productions with highlighting the military service of their illustrious roster of players both past and present. A special emphasis was placed on the contributions of the inaugural 1946 team but all 49ers servicemen were represented through various exhibit pieces tailored to showcase the stories and artifacts of these brave men. Museum director Jesse Lovejoy, in an interview with The Mercury News, lauded the exhibit’s ability to “tell a great story and give these guys the respect and honor they deserve”. The exhibit “Gridiron Heroes: The Stories of 49ers Military Veterans” will be open to museum-goers for the remainder of the 2016 season. This summer, 3000 Nurses and social activists gathered at the Chicago Hyatt McCormick place for the NNU Staff Nurse Assembly and The Peoples Summit, and once again John Murray Productions partnered with Metromedia productions to transform their event space. The cavernous 300,000+ square foot meeting area which included a general session and theater build-out, 15 daily breakout workshops and continuing education classes, 40 expo booths for partnering organizations and evening networking events was one of the largest we have designed to date, and took over 3 days to install. 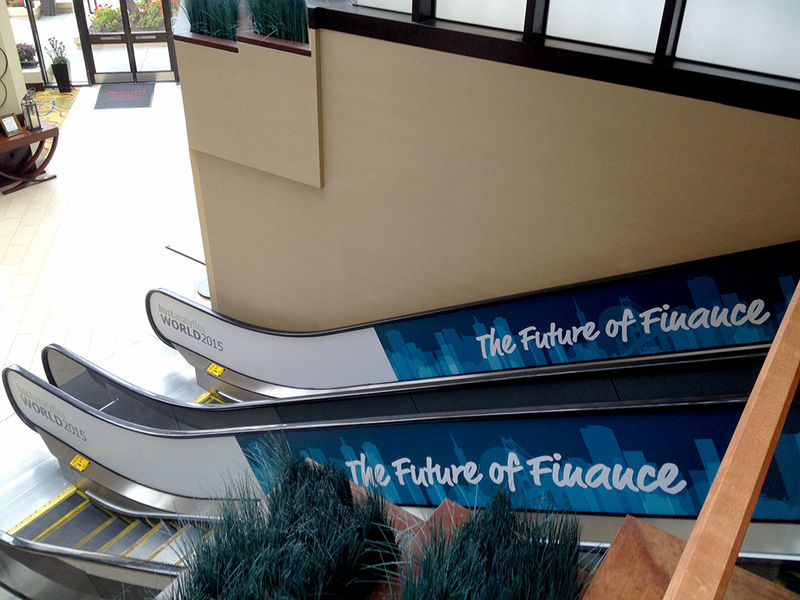 Some of the build-out highlights included a huge seamless 20'x140' borderless screen, over 20,000 square feet of drapery, multiple custom/rental booth build-outs, and a ton of graphics used to transform the space, including all branding and directional signage. It was a feat! But always a pleasure to work with the National Nurses United to support a good cause. You can read more about their political movement here. 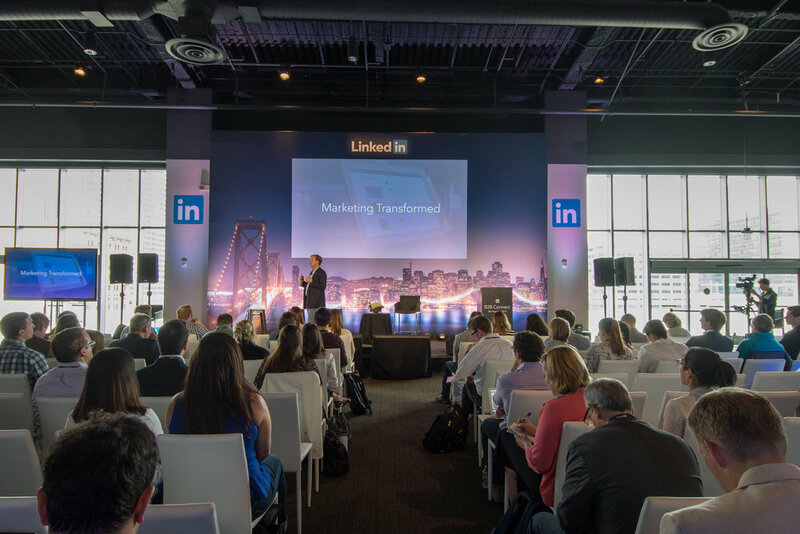 This years Demandbase Virtual Marketing Innovation Summit for B2B was held at Pier 27 and Seamless Show Productions partnered with John Murray Productions for Scenic Design, Fabrication and Print services. 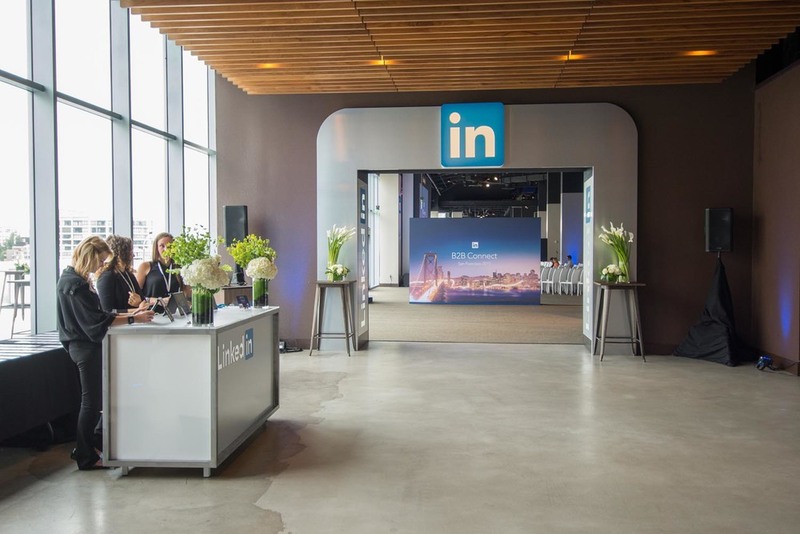 The challenge came in turning the upstairs open-plan event area into a segmented space to accommodate a general session, work shop spaces as well as networking areas for the guests. 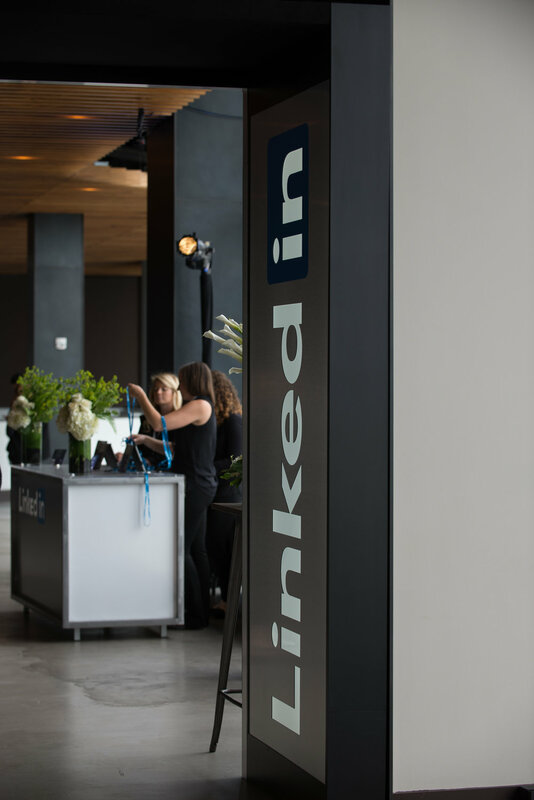 We utilized our theatrical flats and in-house print capabilities to create branded partition walls that provided visual distinction to each area as well as sound absorption for these concurrent event spaces. 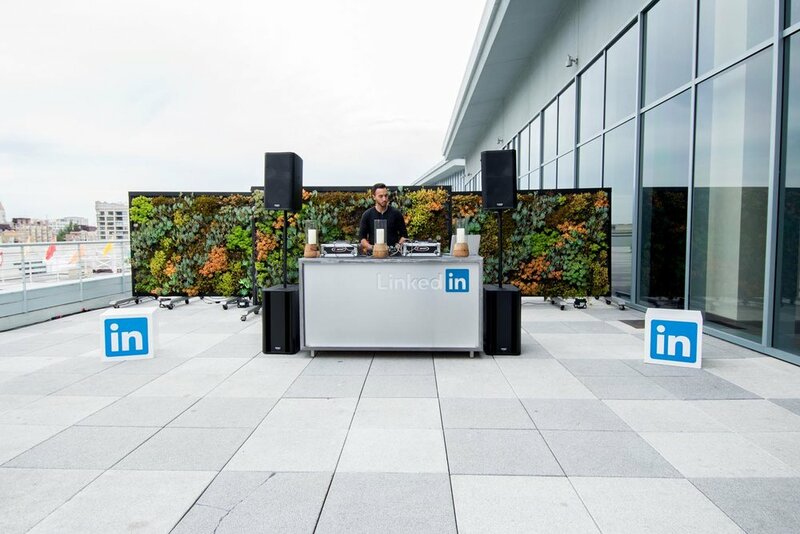 The result was a simple yet highly functional contemporary look consistent with the modern feel of the event space at Pier 27. For the 4th year, Ideas With Impact partnered with John Murray Productions to design and fabricate the set for their Intuit Leadership Conference, held at the Terranea Resort in Los Angeles. This year's set included a backdrop composed of our rental 2x2 tile set, with a dimensional floating logo and unique graphic appliqués on select tiles for a custom center stage design. 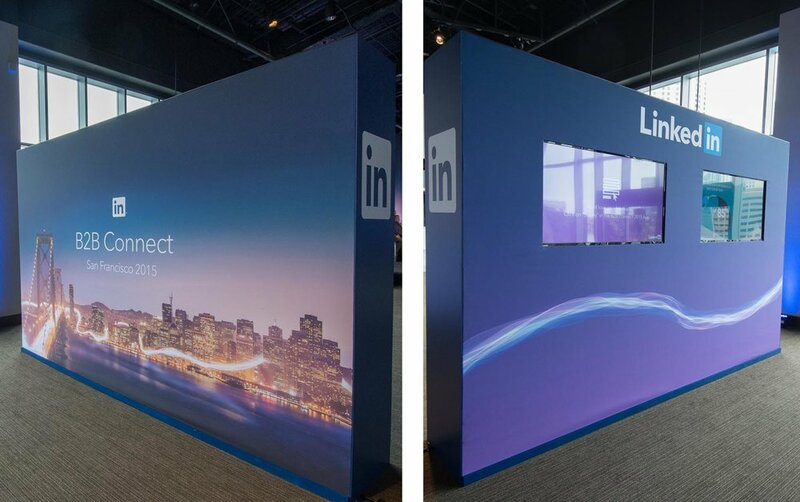 Two flanking 12'x21' screens with hard screen surrounds and upstage cyclorama completed the look, resulting in a dynamic color changing set complete with bold branding, providing the ideal backdrop for the software giant's leadership conference. Leerink recently held their partner summit at the Meadowood Resort and Spa in Napa and John Murray Productions partnered with Wilson West and Nolder Media to provide scenic design and fabrication services. The set was designed to fit within the look and feel of the resort in Napa, including 2 screen surrounds with mahogany reclaimed wood accents, custom fabric-wrapped flat panels and custom staging. The end result exceeded our clients expectations and the set looked just like our conceptual 3D renderings! 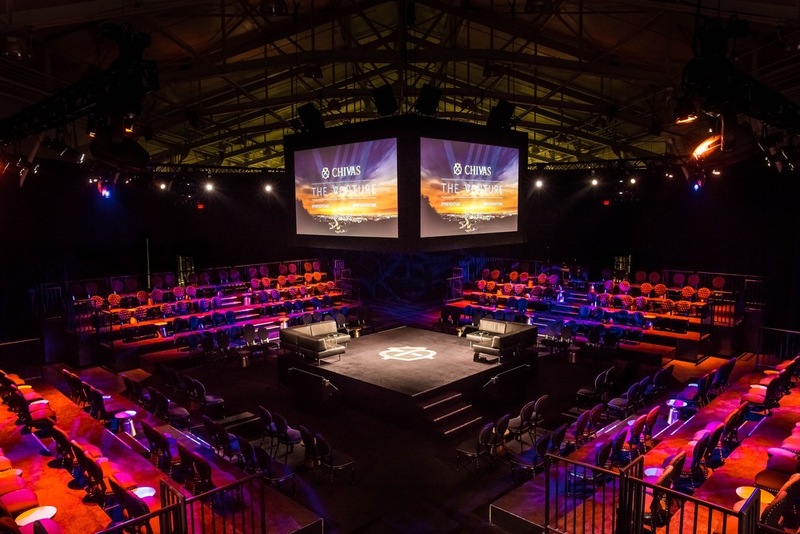 In July 2015 "The Venture" project, sponsored by Chivas Regal culminated in San Francisco at Fort Mason Herbst Pavillion and event producers the projects* reached out to John Murray productions to assist with scenic design, production, and fabrication services. The challenge was turning Herbst pavilion into a fully interactive event space for the final pitch from 16 finalists from a group of over 1000 promising social entrepreneurs who strive to make a positive, scalable impact on the lives of others. 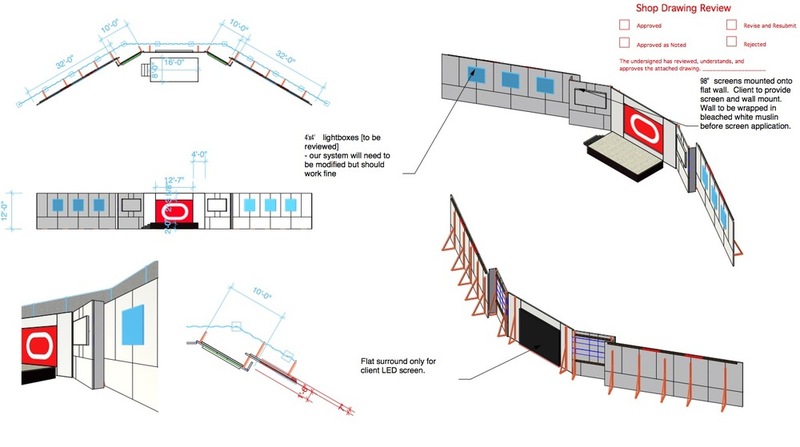 The solution was to partition the pavilion into separate areas which included reception, an interactive exhibit area complete with 16 display boxes for finalists to display their product/startup ideas, an in-the-round presentation stage complete with tiered seating platforms for each finalist to make their "final pitch" and an after party/chivas bar area for after show drinks and networking. 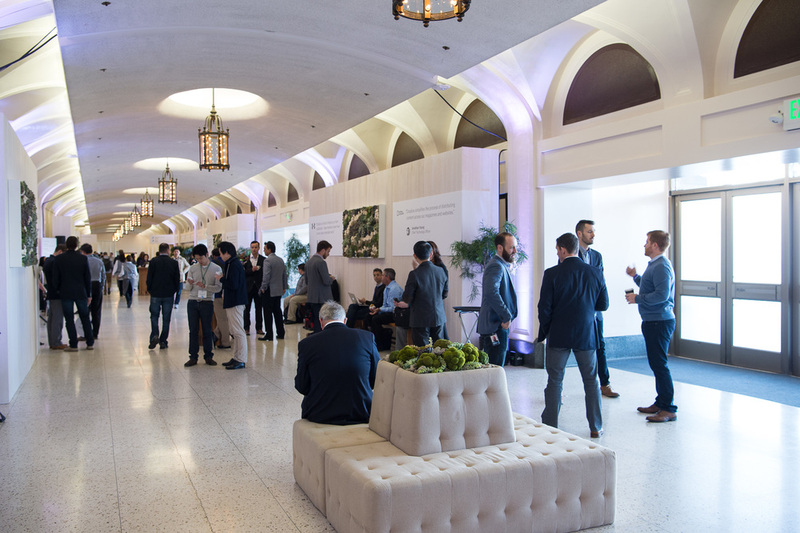 For the 2015 Dropbox OPEN, John Murray Productions collaborated with the scenic designers of MKTG and Dropbox to develop, fabricate and install unique & interactive environments both inside and outside San Francisco’s Bill Graham Civic Auditorium. A high end, whitewashed ‘pallet themed’ design was chosen for the overall presentation. Six 4-sided kiosks provided each of the 24 Dropbox Partners a workable presentation and storage space, complete with a 30” monitor. 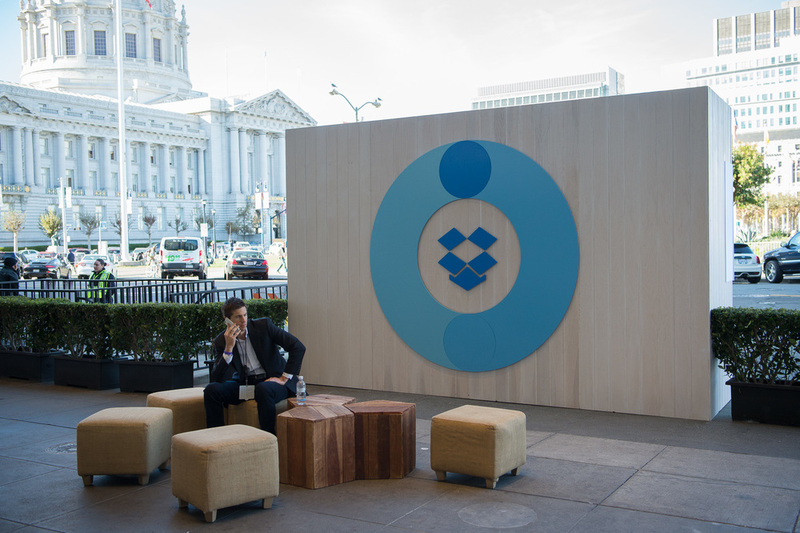 In addition, four larger Dropbox Activation areas gave Dropbox associates an inviting presentation space to present the new business services launching by Dropbox. The resulting color-coded expo environment allowed conference attendees to quickly scan the entire area to determine which of the various expo Partners and Activations would be most suitable for their needs. 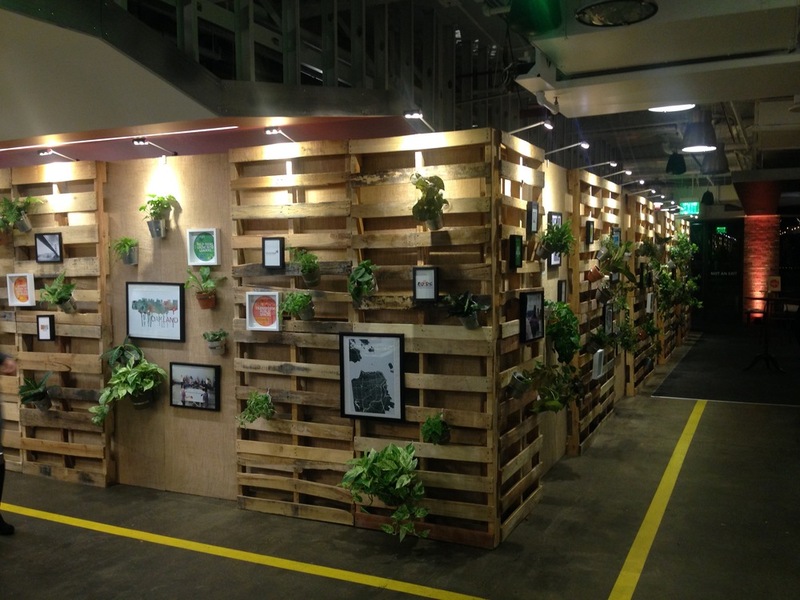 Throughout the entire first floor of the Auditorium we installed 10-foot high pallet walls to provide thematic continuity which were used for a variety of branding purposes, including a living plant and floral display that weighed over 500-pounds. Outside the facility we continued the ‘pallet theme’ by erecting three custom branding opportunities, including a double-sided, 10' x 16' x 4' structure, complete with dimensional 8-foot diameter Dropbox logos. 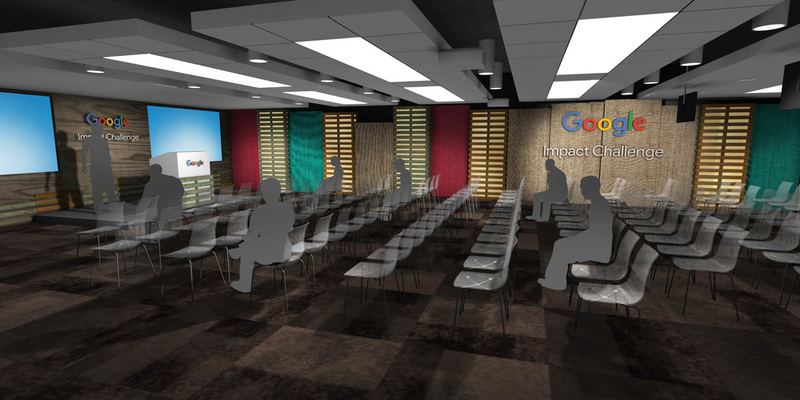 In December of 2015 Blue Flame LLC partnered with John Murray Productions to create the environment for the Google Impact Challenge, in San Francisco. $5.5 million in funding was was awarded to Bay Area Non-profits along with support from Google volunteers focusing on projects with innovative, ambitions plans to improve the lives of local residents. John Murray Productions provided the scenic fabrication and installation which was composed of a combination of rental and custom fabricated scenery, including reclaimed wood and recycled pallet walls. The final result was a modern yet understated industrial set, which supported with the events focus on non-profits and sustainability. Check out the good work these organizations are doing here. 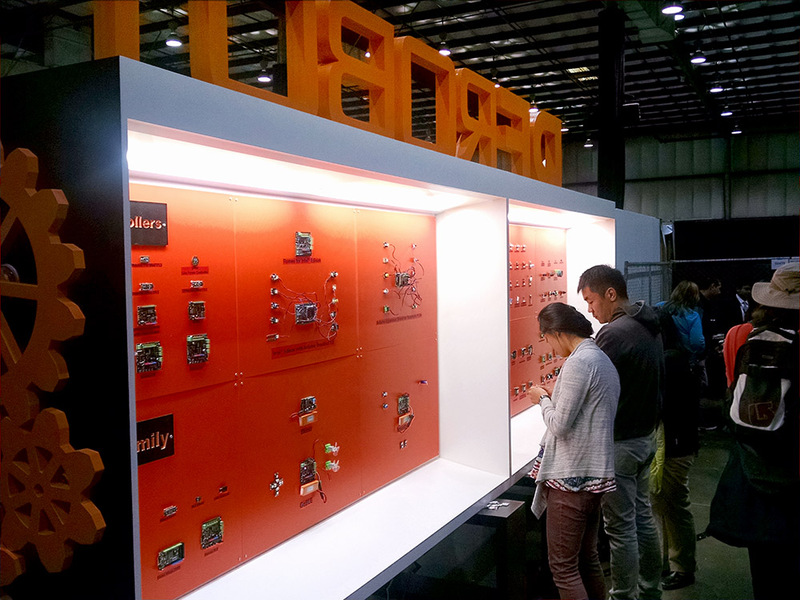 When DFRobot, a robotics and open source hardware provider, needed some last minute custom fabrication for their exhibition booth at this year's Bay Area Maker Fair, John Murray Productions was happy to hop on board to build their display. The exhibit featured a 10' high x 17' wide internally lit booth where various mechanisms were put on display for attendees. Our CNC router cut the dimensional logo on the top and sides of the booth, as well as the text for their freestanding robot man. The challenge came in getting everything built and finished to museum quality in 7 short days. Click here to learn more about this fantastic international event. Take a look at John getting famous on the ShopBot website! Click here to learn more about how ShopBot tools are used in the fabrication world.